Is Lea DeLaria (OITNB) Losing Weight? 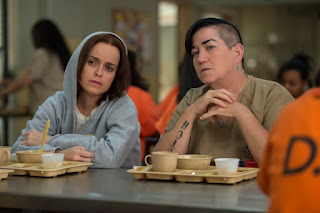 If you have been watching the third season of Netflix's Orange Is The New Black, you might have possibly been asking if Lea DeLaria (Big Boo) is looking like she's losing weight. Turns out that she is, but it's not necessarily for a good reason. Turns out that early on in season two, she was diagnosed with stage two diabetes. Turns out that since the diagnosis combined with the medication she's been taking for it, she's lost her appetite and when she eats, it "comes right out again." Last year, she lost up to 50 pounds. I've known people that are diagnosed with diabetes. They start to eat better, dropping the junk from their diet and they lose a lot of weight. But for folks on the meds, I guess the weight loss happens faster. It seems that if she's managing her condition, she should be fine in the long run. So yes, she is losing weight.